ID Cards Maker (Corporate Edition) is useful to create photo added id cards. Software supports all types of printer to print designed ID cards. You can use excel file data to generate list of ID cards in just few clicks. Using DRPU ID Cards Maker Corporate Edition you can design and print all types of ID cards such as student ID cards, faculty staff ID card, employee ID card, Gate Pass ID Card etc. 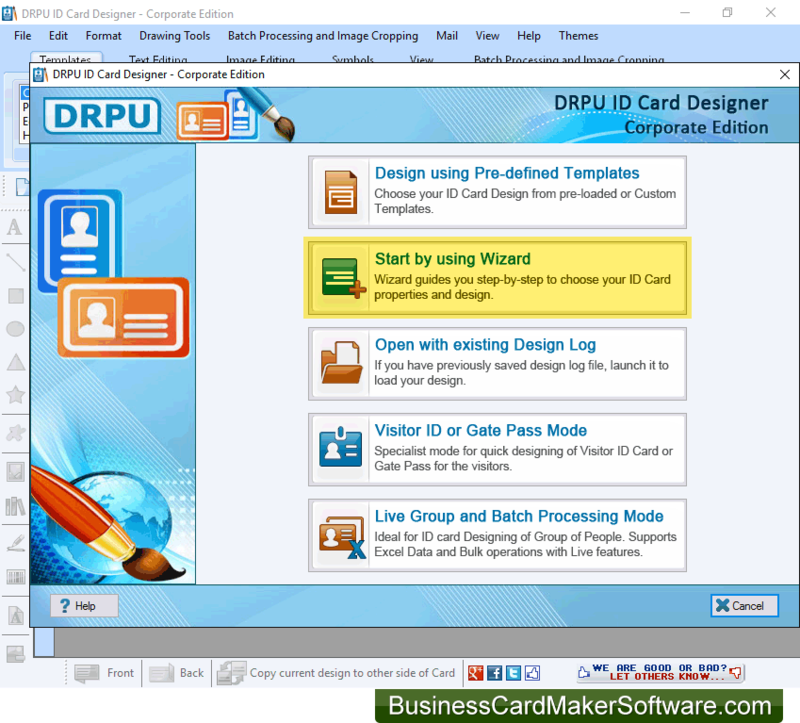 ID Cards Maker (Corporate Edition) has five modules to design ID cards. Select any one module as per your requirement. Here we are going to select "Start by using Wizard" for demonstration purpose. ✔ Software has various ID card designing objects such as Line, Ellipse, Rectangle, Text, Star, Triangle, Barcode, Picture objects etc. ✔ To add photo on ID card you can browse path of photo saved on your computer or you can also take picture using camera settings option. ✔ Software also provides Image Cropping Tool to crop single or multiple images for ID cards. ✔ Program provides specialist mode to quickly design Gate Pass ID Cards for visitors. You can also add visitor details to the database for maintaining visitors record. ✔ For designing ID cards of group of people, software has Live Group and Batch Processing Mode that includes Excel Data and Bulk opertaions with Live features. ✔ Software provides facility to print created ID cards using flexible print settings feature. ✔ You can design ID cards in variety of shapes including Rectangle, Rounded rectangle, Ellipse shape. ✔ Program has option to select image from library during ID card designing process. ✔ Provides option to copy current card design to other side of card. ✔ Data Set Series feature allows to generate the multiple ID cards with different barcode and text value. ✔ Software has facility to send created ID card at specified email address using email settings option.